Dash7 home automation basics, IoT,M2M | What is Dash7? This page covers basic features of Dash7 technology. It covers Dash7 home automation concept used in M2M and IoT(Internet of Things). It is basically open source RFID standard used for WSN(Wireless Sensor Networking). It operates in 433MHz frequency band. The Dash7 technology is promoted by DASH7 Alliance. This technology provides long battery life and coverage of about 2Km in indoor places. Following are the features of Dash7 wireless technology. Data rate 200 Kbps max. The RFID technologies such as NFC and Dash7 is widely used in WSN(wireless sensor networking). Most of the smartphones will have these technologies integrated to provide many facilities to the users. These include building access, mobile payments, advanced location services, home automation, ticketing and more. This means that Dash7 will be part of IoT(Internet of Things) which acquires sensors data and use that to manage social network applications. There are four different device classes defined in D7A (Dash7 Alliance Protocol). • Blinker:It only transmits and does not use a receiver. • EndPoint:It can transmit and receive the data. It also supports wake-up events. • Subcontroller:It is full featured device. It is not always active. It uses wake on scan cycles similar to end points. • Gateway:It connects D7A network with the other network.It will always be online. It always listens unless it is transmitting. D7A describes full functional RFID tag. All the devices in Dash7 network supports one or more of the above mentioned device classes. 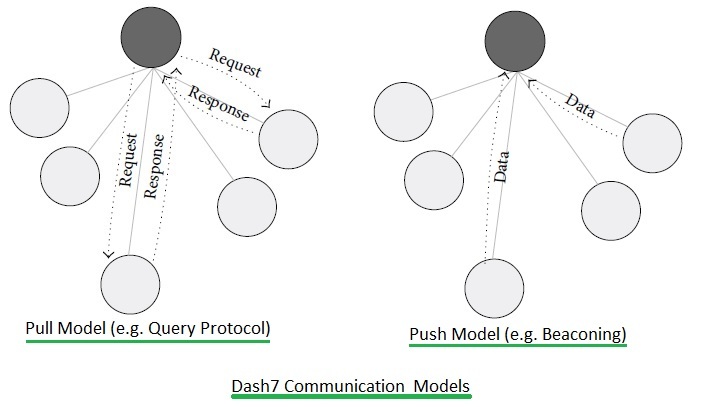 DASH7 supports two communication models: pull and push. The dialogs between tags and interrogators are query response based(referred as pull model). This request response mechanism is described by the D7A Query Protocol Data transfer initiated from the tags to the gateway on the other hand is based on the push model. Both of these models are depicted in the figure-1. This approach for instance is implemented as an automated message or beacon which is sent on specific time intervals. This system is called Beacon Transmit Series. DASH7 defines two types of frames viz. a foreground frame and a background frame. The foreground frames are regular messages which contain data or data requests. Background frames on the other hand are very short broadcast messages. Background frames are used by the D7A Advertising Protocol for rapid ad-hoc group synchronization.